If any British historical figure led a career which could be described as operatic, it would have to be Mary Stuart, Queen of Scotland. Even in her own lifetime, she deliberately sought to play a role which conformed to dramatic convention. At her execution she donned the red cloak of martyrdom and, like her grandson Charles I under similar circumstances, she adopted a conscious pose of wronged innocence by which both of them almost succeeded in making many of their gullible contemporaries forget the disastrous errors of judgement and outright deceptions which had led them to the scaffold. Schiller’s play Mary Stuart added the missing element of confrontation to the dramatic mix by introducing a totally unhistorical meeting between his heroine and her antagonist and captor Elizabeth I of England, a juxtaposition so fitting that it has become a staple of many more modern retellings of the story, quite apart from the constituting central climax of Donizetti’s operatic Maria Stuarda. 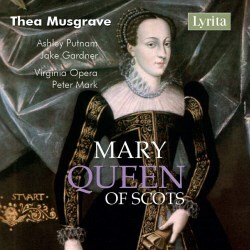 Thea Musgrave, on the other hand, sidesteps the portrayal of the would-be martyr by concentrating on the earlier period of Mary’s career, her short-lived and personally disastrous reign over Scotland during the six years when that country was wholeheartedly converting to the Calvinist faith, and the Catholic queen’s tangled relationships with a whole series of unsuitable men whose jealousies and feuds effectively reduced her to ruin. And there are as many dramatic and operatic situations to be found in this period as in the more conventionally tragic era of her demise. Musgrave’s libretto does not always adhere faithfully to historical accuracy, but she cleaves more closely to the general sequence of events than did Schiller or his successors. At first, seeing the provenance of this recording, I suspected (and rather hoped) that this would be another release in Lyrita’s valuable series of Richard Itter’s broadcast transcriptions, possibly deriving from a BBC relay of the first run of performances by Scottish Opera in 1977 with a decidedly impressive cast of mainly British singers from that period: Catherine Wilson, Jake Gardner, David Hillman, Gregory Dempsey and Stafford Dean took the principal roles at that time, with the composer herself conducting. But what we have here is a reissue of a later production from the USA six months later, with the conducting now in the hands of the composer’s husband Peter Mark and an entirely new cast with the exception of Gardner in the leading male role of Mary’s illegitimate brother James Stewart. This set was originally released on LP by Novello (Musgrave’s publisher) in 1979 and has since resurfaced in a number of guises from variously attributed labels and distributors. I recall the BBC relay of the first Edinburgh performances where my impression was that the important chorus parts were more securely taken than here, but presumably those tapes are lost for ever (when the BBC broadcast the opera a couple of years ago, they employed this Virginia Opera recording); and otherwise the American cast generally seems in no way inferior to that I recall through the mists of memory some forty years ago. The recorded sound is very close-miked and dry; the chorus of monks at the very outset sound like a few singers clustered in an airless room rather than a theatre acoustic, but the balance between stage and pit is realistic. And at least one can hear the instrumental detail rather than an amorphous orchestral mush, and the diction of the singers is generally clear enough to make continual reference to the provided text unnecessary. Unfortunately the microphone placement is also sufficiently close to pick up some audience contributions in the form of nearby coughs, which could surely have been removed with modern remastering methods, and some intrusive applause as at the end of the first council scene (CD2, track 1) or just before the end (CD2, track 7). The clarity also serves to emphasise the sheer noisiness of some of Musgrave’s scoring, especially in the many public scenes, and the enormous amount of stage noise in the ballroom scene (CD1, track 4) with the chorus and dancers whooping and clapping with much enthusiasm but little sense of rhythm. And the strings could certainly have benefited from a richer acoustic; they sound decidedly scrawny, and indeed undermanned, in places. The cast here is headed by Ashley Putnam, and her diction is the least clear among the principal members of the ensemble; but that is perhaps to be expected with higher voices, although the characterful tenors of Jon Garrison and Barry Busse seem to come through better. Neither of their characters is precisely attractive, and there are points such as the end of Act One when Busse seems to be fighting a losing battle to be heard over the orchestra (where I seem to recall Gregory Dempsey in the original production coming through with more heroic effect). But surely the balance between the two lovers is wrong here; Jon Garrison as Darnley sounds stronger than his rival, whereas he should surely be overshadowed by the brutal Busse as Bothwell. The latter sounds seriously stressed in the scene where he seduces Mary (CD2, track 6). The principal male role in the opera is however that of Mary’s brother, an equally unlikeable character but well taken here – as in the première – by Jake Gardner who rises to his moment of reflection at the beginning of the confrontation with his sister (CD2, track 2) sufficiently to provoke another outburst of intrusive applause from the audience. There are only two other extended solos in the score, both allocated to Putnam’s Queen. In “Alone, I stand alone” (the end of the same scene) she shows some precarious tuning in the chromatic phrases towards the end, although she too receives applause – which ruins the lush orchestral peroration, an effective lyrical outburst. Her lullaby to her infant son (CD2, track 5) provides one of the few moments of repose in the score, and as this develops into a duet with Gloria Capone’s Mary Seton the effect is beautifully effective (and the audience thankfully this time refrains from intrusive appreciation). The smaller parts are generally well taken, although Kenneth Bell’s Rizzio has a roughness of tone which does not suggest credibly that Mary might have employed him as her court musician. On the other hand, the ‘four Marys’ who attend the Queen form a well-tuned ensemble when they accompany his song in the supper room (CD2, track 3). In the final scene the offstage crowd calling for Mary’s abdication seem too lacking in numbers to pose any sort of serious threat; but then the dramatic tension, with Darnley’s murder and Bothwell’s flight both reported rather than shown, is seriously undermined at this point. The murder of James by Gordon as Mary leaves for England makes for a feeble but noisy final curtain; the sudden assumption of prominence by Gordon, previously a minor character, seems unmotivated, and Francesco Sorianello is rather woolly in tone with his final line “Traitor, you shall not rule!” much too matter-of-fact and undramatic. The set comes with two booklets, one containing a valuable historical note by the composer as well as the usual synopsis and biographical details; the other gives us the complete libretto (68 pages) with full and elaborate stage directions, but there is no translation of any of this material into any other language than English. The layout between CDs is satisfactory, with the second and third Acts complete on the very long second disc, although it is a pity that there is only one track per scene where some subdivision of for instance the ballroom scene might have been welcome. The Wikipedia article on the opera is in error in stating that this recording derives from the US première performance; that took place three days earlier, and the single performance here was given at a “gala performance for the Metropolitan Opera National Council’s Central Opera Services Conference and the Old Dominion University Institute of Scottish Studies.” Considering that it is a straightforward transcription of a single live stage presentation, the performance is well-turned despite the deficiencies of the recorded sound. Following these Virginian performances, the opera received further stagings in Beilefeld, San Francisco and New York; but I can trace no revivals since the early 1980s, and this reissue to celebrate Thea Musgrave’s ninetieth birthday remains the only recording of any of her operas in the current catalogues apart from a BBC transcription of her short 1981 radio opera An occurrence at Owl Street Bridge, also featuring Jake Gardner (NMC 167). We could do with a modern revival and recording of Mary Queen of Scots. In the meantime this reissue will have to do, unless a copy of the BBC broadcast tape of the première perhaps comes to light.